Pioneers in the industry, we offer counting scales from India. 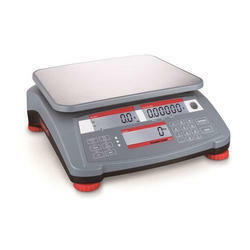 We are amid the most noteworthy names engaged in offering to our clienteles an extensive collection of Counting Scales. A simple frame and bridge design with lift-off platform simplifies cleanup by providing direct access to all of the components. Owing to their excellent measurement and high functionality, the offered scales are widely demanded among our esteemed clients. Largest Display in its Class Makes Ranger 2000 Ideal for Use in All Environments— Ranger 2000 has the largest display in its class and is equipped with checkweighing LED’s and red LED displays which makes it functional in almost any working condition. The Most User Friendly Scale on the Market—Easy setup leads into even easier useensuring that your valuable time is not wasted and you’re working as proficiently as possible. Rapid Stabilization Provides Unmatched Throughput—View your results in just one second, and then see your efficiency, throughput and productivity soar Standard RS232 for Easy Data Transfer Ranger 2000 is equipped with standard RS232, making data transfer a simple process.